Will Chad discover the truth? What is going to happen on Days of Our Lives during the week of September 14, 2015? Check out the weekly spoilers and sneak peek video below to find out what kind of drama is taking place in Salem! 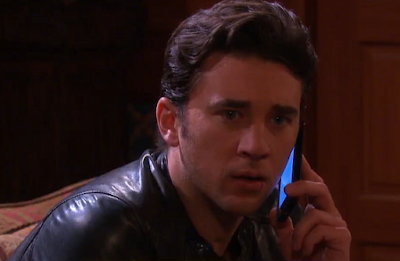 *Chad (Billy Flynn) accuses Stefano (Joseph Mascolo) of framing him. *Stefano and Victor (John Aniston) face off. *Abby (Kate Mansi) encourages Chad to stay in Salem and prove his innocence. *Chad and Abby turn to Marlena (Deidre Hall) for help. *Justin (Wally Kurth) pushes Rafe (Galen Gering) to arrest Chad. *Ben (Robert Scott Wilson) reveals a secret to Abby. *In the aftermath of Paige's murder, JJ (Casey Moss) warns Jennifer (Melissa Reeves) she could be in danger. *John (Drake Hogestyn) begins the search into his past. *Aiden (Daniel Cosgrove) plots to keep his secret. *Steve (Stephen Nichols) tries to make things right with Joey (James Lastovic). *Steve upsets Kayla (Mary Beth Evans). *Steve and John plan to search for Bo. *Bo (Peter Reckell) worries that Hope (Kristian Alfonso) is in danger. *Gaby (Camila Banus) is released from prison. *Gabi, Will (Guy Wilson) and Arianna (Harper and Sydnee Udell) have a warm reunion. *Eve (Kassie Depaiva) breaks down.